Our first stop was at the viewing point known as Lincoln’s Rock where we enjoyed a short walk. 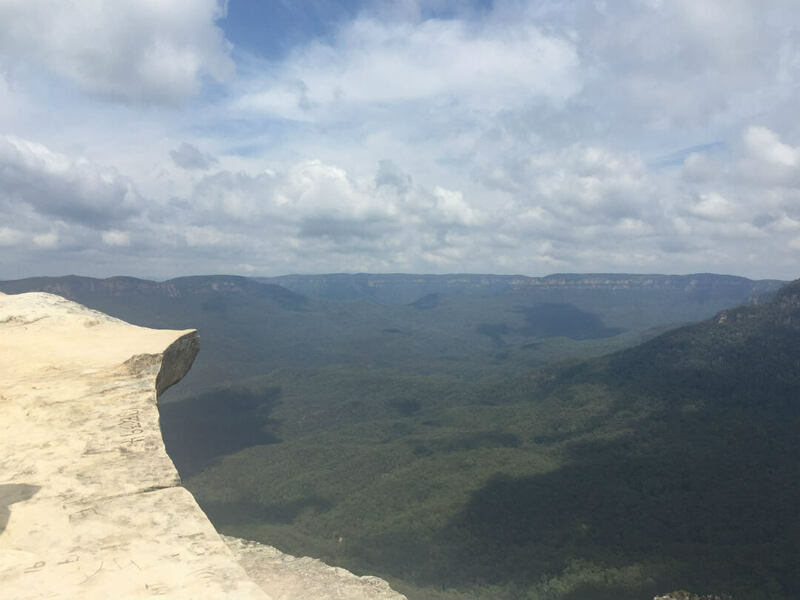 Standing here makes you feel like you are on the edge of a cliff – the deep green chasms, blue mountains and bright sky make it very memorable. This area used to be known as Flat Rock but was renamed in 2013 as Lincoln’s Rock. This name comes from a famous Australian mountain climber who lives in nearby Wentworth Falls – Lincoln Hall. In some areas the rock was flooded with water from recent heavy rains. Our tour leader showed us how the local Aboriginal people would use the rock to get colour to paint their bodies. By using a combination of different coloured rocks and grinding these down to a fine paste, they can create red, white, yellow and green paint. We continue to the Blue Mountains National Park, not far from Lincoln’s Rock, it’s take less than 15 minutes drive. Once again I was amazed by the scenery in front of me. It is prettier than what I had imagined and seen in photos. They call it “Layers of Time”, it is seen as layered and blended colours from the green trees, the blue mountains and the blue sky. From here you can see Mt Strzelecki, Mt Caley and across it is Mt Hay. Everything is clear from here. If you look to the right, you will see a very high waterfall. We continued the tour to Eagle Hawk Lookout. I started trying to guess what I would see from here. Yes, of course the Blue Mountains, but with a slight look to the left I saw three distinct cliffs….. I am sure you can guess these are the Three Sisters! The Three Sister’s legend is a story of an Aboriginal tribe. My tour leader says that there are several versions of this story. All of them said that the stone was once 3 sisters who were bewitched into stone. He mentions that the legend of Three Sister is very famous and throughout the day, the Three Sisters emit a different colour because of the reflection of the sun. By now it is time for some lunch, so our tour leader drives us to a town called Leura near Katoomba. There are many different places to choose to purchase a meal, ranging from takeaways, small cafes and restaurants. If you want to try kangaroo meat you can have it here – one of the cafes also provides Kangaroo Pie that you can try. It is quite a nice main street with a few shops worth stopping in at for souvenirs and trinkets. All up we had about an hour to spend here before rejoining our tour leader. After lunch we were given the option to purchase tickets for Scenic World, a series of rides and attractions located near Katoomba, approximately a 10 minute drive from Leura. The tickets for this cost $39 and I paid the tour leader directly. All but 3 of the people on today’s tour decided to visit Scenic World. The few who didn’t were able to have some free time in Katoomba and we met up with them later. The first attraction ride I did was Skyway. I was looking forward to this ride which is suspended 270 metres above the treetops below. When I get onto the Skyway I am no longer happy – when I look down the floor is made of clear glass and I remember I am afraid of heights! This fear quickly gives way though as we begin the 720 metre journey with amazing views of the Katoomba Falls, Three Sisters and Jamison Valley. For those truly afraid, there are seats and sections of the ride with solid flooring so you are not tempted to look below. Immediately afterwards I queued up for the Cableway. The Cableway goes down to the Jamison Valley and back to the top of the escarpment. 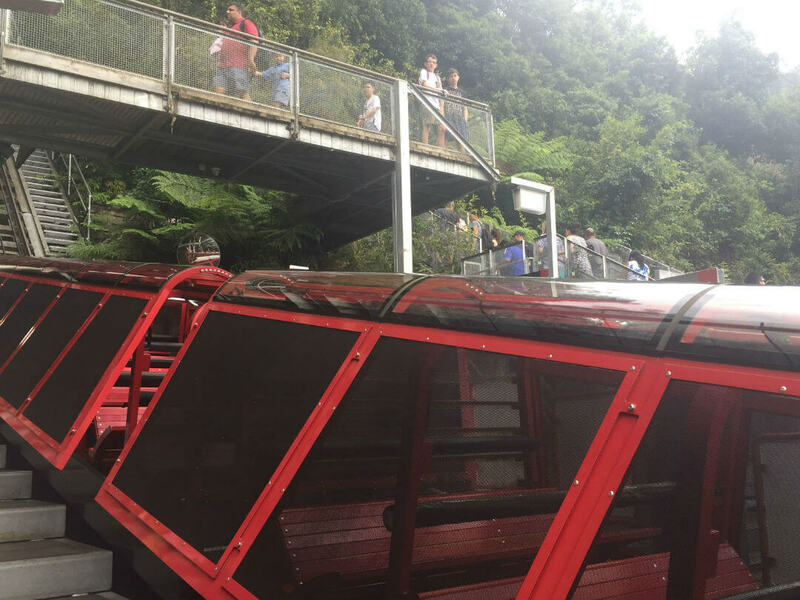 Slightly shorter than the Skyway, it nonetheless provides a thrill and more amazing views of the Three Sisters, Katoomba Falls as well as Orphan Rock, and Mt Solitary. It is the steepest and largest aerial cableway in the Southern Hemisphere. From here you can wander along the Walkway and see beautiful rainforest before heading to the Railway. 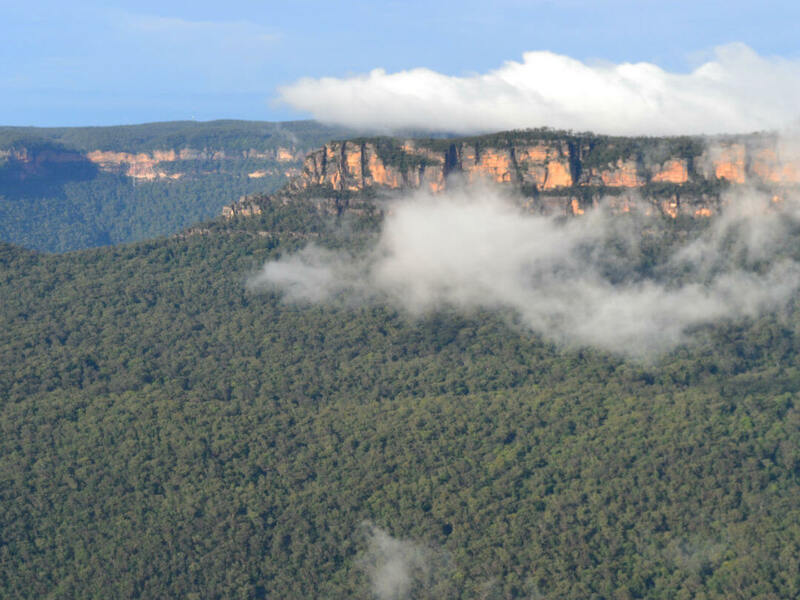 Want to find out more about The Blue Mountains? Including our favourite tours, latest specials, travel information and plenty more. See our Blue Mountains Things to Do Travel Guide.